I’m a mom to a kindergartener so most of our “day” revolves in some shape or form around the alphabet. We trace letters, write our letters, makes letters with play dough. We have sung the “abc song” more times than I care to remember. We practice the sounds each letter makes over and over again but,after four kids it can get a little stale. As an Early Childhood Educator I have resources at my finger tips so I know that there are so many fun ways to reinforce your child’s learning of their “letters”. Today we rounded up a few of our favourites printable’s and put them one easy to find place to keep the learning fun! You will find free colouring pages, flash cards and activities to introduce the “a,b,c’s”, reinforce letter recognition and writing skills. These alphabet printable’s are suitable for preschool, kindergarten and first grade so there are a lot of options to chose from. My absolute favourite are the play dough mats. It’s no secret that we love play-dough! I have discovered that our youngest, is a tactile learner. She loves shaping the letters over and over again and we have noticed that it has helped her to recognize not only the upper case but the lower case letters. Learning should always be fun and I’m sure this list of alphabet printable’s will be a huge hit in any household. As always all of the links have been checked to make sure that they work so, if you find a glitchy one let me know. These are perfect printables for younger kids! I love that technology has helped to give kids so many more tools to get to learn with! I know my nephews loved when they had homework like this to do at home when they were younger. I thought I was beyond need things like this – my kids are a little older now. But lo and behold my grandson moved in and I am right back to needing them again. So thank you very much for sharing. This would be so great to use in the classroom or to help your kids study up in a fun way on the weekends. Thanks so much for sharing! These are great! My daughter is just getting ready for this so I will be checking them out. Thanks! I have a three year old so this is perfect timing! I am going to spend some time with this to get some cool alphabet learning tips! I have a couple nieces who can probably make good use of this round-up with their little ones. Thanks for sharing. What a great collection. My kids also loved writing in shaving cream on a tray. Very tactile. these printable are the CUTEST! can’t wait to use these with our little guy! My son is five and learning his letters. I’ll be pinning this to come back to it later. Thank you so much for sharing this! This is so cute! I learned my alphabet from a game my mom and I used to play! It was like this board, where if you touched a button that button would light up. So my mom would ‘draw’ letters and I would say what it was, and we eventually got to words. It was great because we did it before bed at night! Thank you for sharing! I will save them till I have kids! Thanks for sharing. You can never have too many printables. The kids go through them super quickly. All these printables are so so so cute!! I love finding online printable resources for everything, so obviously I’m sharing this roundup for later. Thanks for sharing! I think that Alphabet BINGO is a really cute concept. I also really like the type of alphabet printables that have kids draw pictures in a space while writing words down below. These are fun and cute printables. I will pass this on to my niece who is a teacher. These are all so gorgeous! I am going to sit down and print some of them off right now! What a helpful list! I think these are great. It’s never too early for kids to start learning. Oh yay! These are perfect, my son is practicing letters now and I needed new coloring sheets for him! Thanks for this awesome list! This is perfect for the pre-schooler in my family. I’ll be passing it along! Thank you for this list. I’m actually currently teaching Madison her alphabet so this is perfect! Certainly a fun way to learn the ABCs and a great idea for kids that need a little extra. My sister used something similar this is very useful thanks! A friend of mine does crafts with her triplet nephews. I plan to share this with her. Thanks! Those printables are so great, especially alphabet bingo!! Love teaching children in a fun way! Thank you for sharing it! We are big Play Doh fans here too. And printables, we do love them so. What great printables. I am doing letter of the week with my son, these would be perfect to use! This is such a great resource! I love using free printables for my Little Man! And, we need to keep working on his letters, love those! Wow these are awesome. I will have to get some of these for my 3 year old grandson. I love spending time with him doing stuff like this. What a great idea! I have the grandchildren one afternoon a week and this is a great activity to have for them. They are Kindergarten and preschool so this iw perfect! These printables are so cute especially alphabet bingo. I think that is really important to teach children in a fun but informative way! What a fabulous resource got homeschooling or afterschooling! I have a 2 year old and a severely autistic teenage daughter that these would be useful for. What cool printables. My son would have loved these when he was younger. He loved coloring and writing as early as age 2. These are awesome thanks so much will definitely be putting them to use. Laci. What an adorable and helpful printable! Totally passing this along to some of my mommy friends! They will love! 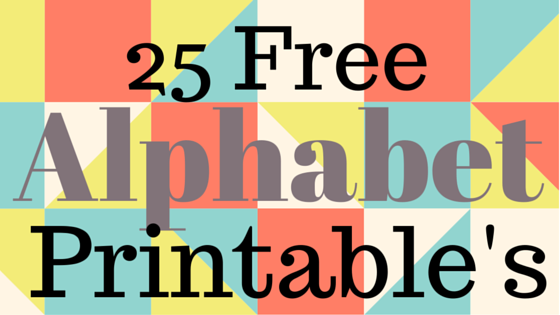 This is a great resource for Moms and Dads that are teaching their kids the alphabet! Almost makes me wish my kiddos were little again so I could use them! These are great, Heather. My niece just started preschool and these are really going to help her practice. Thank you for including our printable! This is such a great resource, I’ll be sharing it on my FB page!